Michael Kearney Medical furniture bespoke lifts and tilt recliners. They also have Orthopaedic and Carer benefits, but they can be just useful for anyone who requires two or three attempts to raise themselves from relaxed and seated positions. Our Riser Recliner Chairs will benefit anyone with reduced (or reducing) mobility resulting from old age, injury or illness. They are also an asset to anyone who uses wheelchairs as have removable arms. Also ideal for anyone who suffers from arthritis or obesity, and those suffering from chronic back pain. 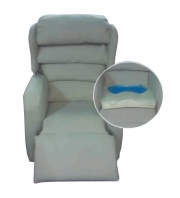 If you have difficulty lowering yourself into or raising yourself out of a chair, then our selection of recliners chair may assist you in important and repetitive aspects of your everyday life. Michael Kearney Medical Furniture offers numerous seating solutions pressure with built in foams of low castillated, medium visco, and gel liquid with visco high, waterfall back on all our recliners offer orthopaedic gains. Seating and back is covered in a breathable, easy cleaning dartex material external frame can be in cloth or leather. Our individual recliners are built to your needs, its advantage are for the owner is the independence that it confers on its users. Providing that the person has the ability to move around once standing, the lift chair removes the need for a third person, assistance in ability of sitting or standing up. 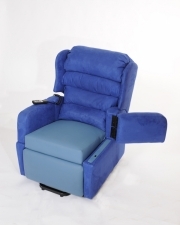 The Real benefits of Michael Kearney Medical Furniture riser recliner chairs, they are bespoke to aid and enhance independence, avoid muscle and back strain and dramically reduce the likely hood of falls when ascending or descending into or out of our chairs.